As we made our way from Thailand to India we stopped first in Malaysia with Singapore next on our destinations. 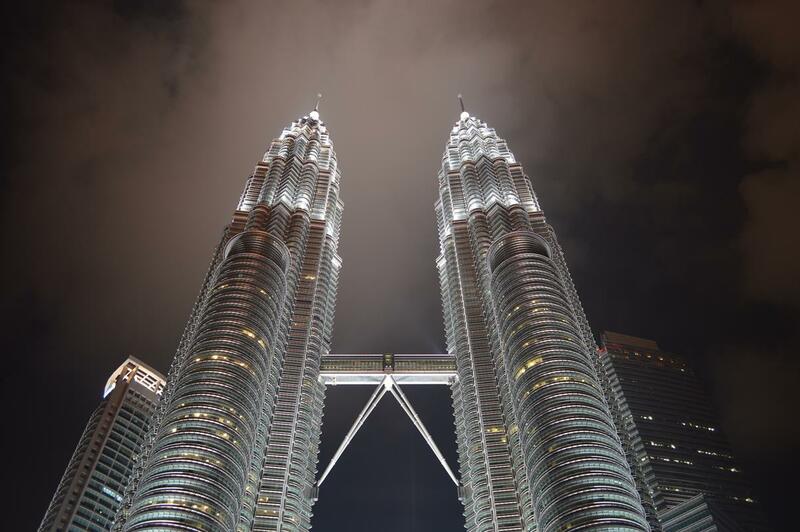 We only spent 3 days in the capital of Malaysia, Kuala Lumpur, but there’s not a lot to do in the city so 3 days was more than enough time. Since it was so hot and humid in Kuala Lumpur we tried to not be out for too long. This was an interesting dilemma because our hotel room felt like a jail cell and felt as small as one, so we obviously didn’t want to be in there long either. I’m not kidding though, with no windows in the room and only space for one to walk to one side of the bed and in the front of the bed it was starting to make us go insane. When we needed space to breath we went out to walk around the city in search of food. The best place for us to find food was in the mall food court where there were several options, not many of which were local though. 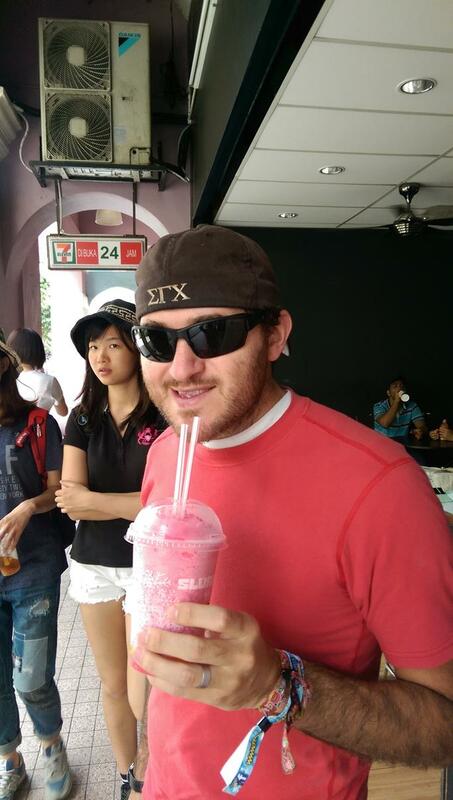 Thankfully, we had a 7-Eleven across from our hotel that had slurpies so we were constantly making that route. 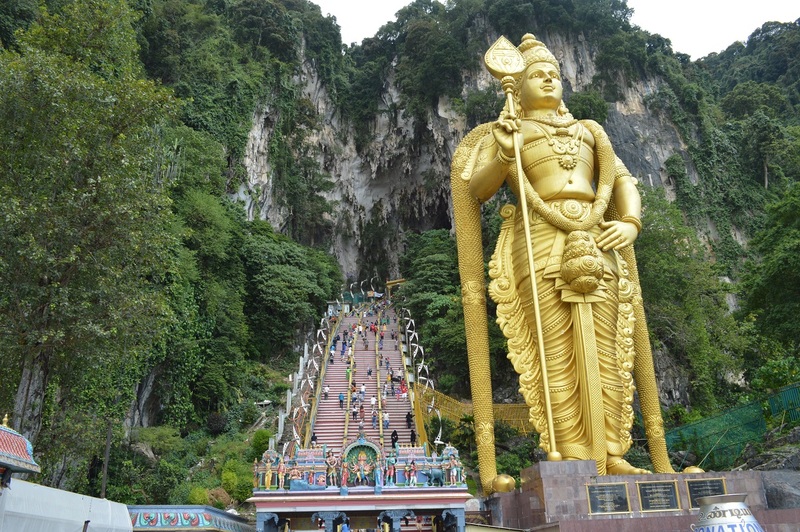 One thing you should do when traveling to Kuala Lumpur is visit the nearby Batu Caves. It’s very easy to get there, we just jumped on the metro for 35 minutes and arrived across the street from the caves. There are a couple hundred steps to get to the main cave, but they’re worth the climb. There are 3 caves total, 2 of which cost to go inside (one was 5 MYR and the other was 30 MYR- cost a lot more because it was with a guided tour that went deep underground). Inside the Caves are old temple grounds where people still visit to worship (if they can get enough silence from the chaos around them). There were se veral monkeys everywhere stealing things (mostly food and drinks) from tourists, and we would hear shouts or screams every few minutes from people. Plenty of dumb tourists were holding out food trying to get photos with the monkeys and attempting to hold them… So there’s plenty of entertainment while visiting the caves. There was construction going on while we were there however so it was disruptive to the temple atmosphere. One of the construction workers asked several tourists to carry a brick with them up the stairs (remind anyone of Tom Sawyer? ), including Pablo and I. The whole experience at Batu Caves was entertaining and possibly the highlight of our Malaysia trip. It was my birthday while we were in Malaysia so we celebrated by going out to eat at a nice restaurant. In our search we were surprised to find an Outback Steakhouse in the city, I couldn’t believe it! I hadn’t had a steak since we’d left home, and I can’t describe how happy I was for that meal. To make it even better we had cravings for root beer floats and after a long time of searching we found a large tub of vanilla ice cream and a liter of root beer. Since we didn’t have a fridge or freezer in our hotel we had to consume it all. After being stuffed we walked over to the famous Petronas Towers, which were the tallest buildings in the world from 1998-2004. The towers are even more impressive lit up at night and apparently there’s a water and light show behind them, but we’d just missed that. We opted not to pay to go up the towers either, but just enjoyed it from the outside. It was a good birthday and overall a fun short trip to make into Kuala Lumpur. If you’re traveling to Malaysia I’d recommend planning only a couple days in Kuala Lumpur and then head to the beach and other areas outside of the city. Would you feed a monkey if you knew it would possibly bite you?